A great day was had in Wallingford with the Olympic torch in town. Well wishers lined the streets in support and everyone enjoyed a great atmosphere. Over 7,000 people gathered in the town centre to cheer on the Olympic flame, which arrived at approximately 8.30am. It was a fantastic turnout with much of the community of Wallingford in attendance. There was a real sense of community spirit and an excitement about the Olympics. Our very own William Anderson of Swindon Motorpark had the honour of being a torch bearer and was greeted with applause by the excited crowd.William fed back he had not slept a wink the night before with the anticipation and honour of being torch bearer for Wallingford. He felt humbled and incredibly honoured to part of the Olympic celebrations and He is looking forward to continuing the great work he does within the community. We are incredibly proud of William and the great work he does in the local community. We would also like to thank Lloyds Bank for giving William and Cambria the opportunity to be part of the Olympic celebrations. 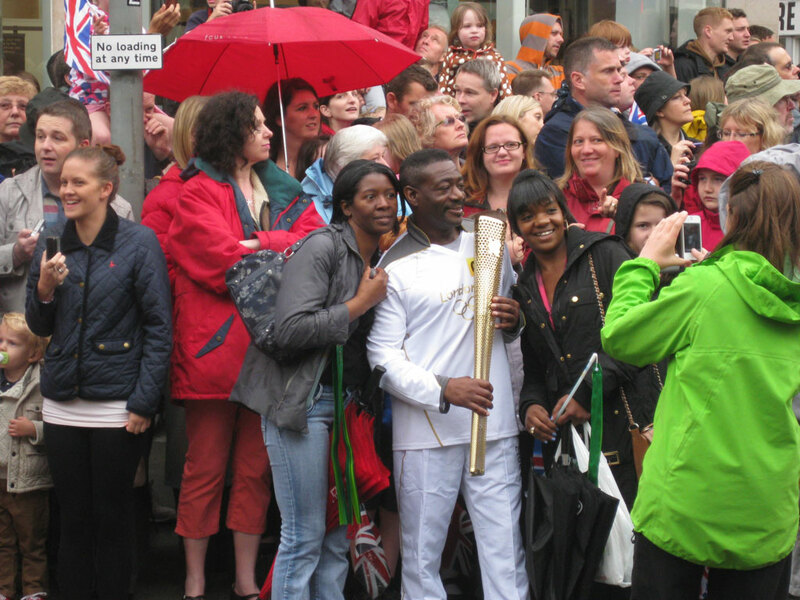 Despite the rain, it didn’t dampen anyone’s spirits as the Olympic torch brought people together from all over the community. Thank you to everyone involved in organising the event which went like clock work. What a great day to be part of. This entry was posted in News and Events and tagged lloyds bank, olympic flame, olympic torch, torch bearer, travel, vacation on July 10, 2012 by motorparks.